This project is using “Chapter 8 – Creating Projects with the Raspberry Pi Camera Module” of my Raspberry Pi Cookbook for Python Programmers book, which has a recipe called “Creating a stop frame animation”. The recipe in the book is intended as introduction to using the Camera Module for animation, however it was enough to try the idea out and the book provides all the detail needed to expand and customise it to suit your own requirements. 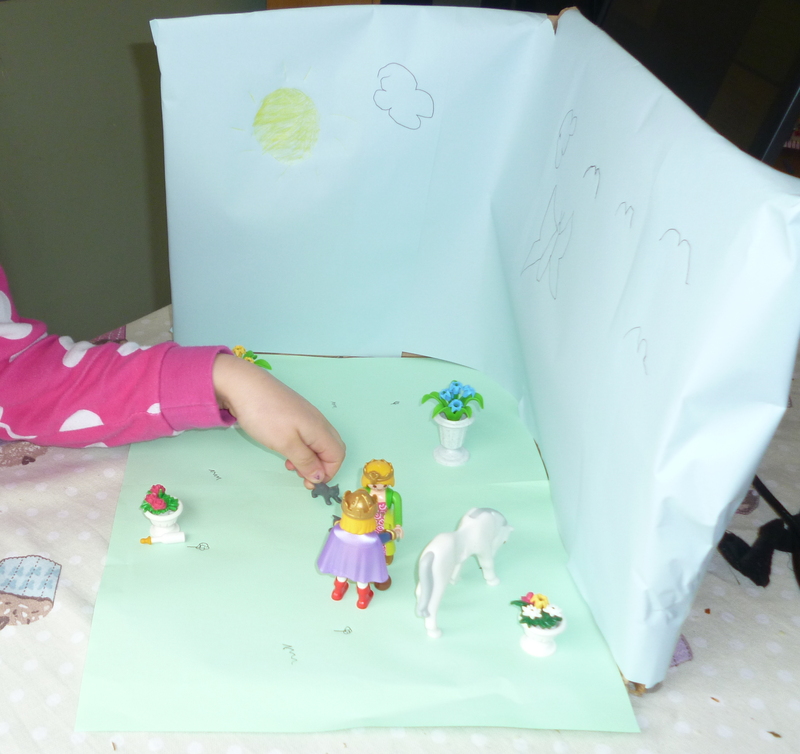 Ever since I wrote the section in the book about using the Raspberry Pi Camera module for stop-frame animations, I’ve been keen to let my daughter have a go with it. Overall it makes an excellent project to do with kids since it fires up their imagination, gets them to use technology in new ways and most importantly allows them to make choices and decisions on what they want to achieve. Younger kids will enjoy the play and storytelling aspect, without needing to follow a prescribed list of steps or instructions, which they often find difficult to keep focused on. While older kids (or adults) will probably find the planning and construction side more interesting, with the additional challenge of expanding the application’s features and adding additional hardware to their setup. Often it is this tinkering with software/hardware which can provide the best learning experience, requiring problem solving, design and creativity skills to achieve their goals. The setup includes a standard Raspberry Pi, Camera Module, SD Card and Wifi Dongle. The Stop Frame Animation setup needs a Raspberry Pi (Model A or Model B), with a normal (not the NoIR version) Camera Module. For my setup, I used a laptop connected via SSH, using the Wifi dongle to provide a network connection. We can connect using a laptop for display and control (via X-Forwarding), allowing the Raspberry Pi more mobile without needing to be wired up to a screen / keyboard. I also had the home directory of the Raspberry Pi shared on the network, making it easy to access the files used. This setup is also detailed in “Chapter 1 -Getting Started with a Raspberry Pi Computer” of the book. The screen on top of unit is a 2.8″ TFT + Touch Shield Board – I didn’t use it this time, but potentially it would work well as viewfinder and controller in a future project. Add to that the D-Pad Controller module (available here) and we could add some hardware controls for shutter, settings and reviewing of images, we’d have quite a useful animation machine! The small post-it notes are some story plans/cast directions written by the “director”…she had lots of ideas of what she wanted to do, even before we got started! This shows the magic of being a child, so full of ideas, as a boring grown up I was struggling to think of something interesting to animate. There were also a few “extras” milling around the set, hoping to get their chance of fame. We begin by building our set, a quick stage created by cutting two sides off a box and wall-papering using coloured paper for the grass and sky (if you look closely the set designer also added some extra details prior to the filming!). Our stage took shape very quickly and the cast were eager to get started. This was the most difficult stage of the process (for me), letting the “director” make her movie. With lots of instructions from me: “move them just a small bit” and “don’t move them too far”, I was soon sounding like Nick Park (the creator of Wallace and Gromit) did when he enthusiastically explained animation on TV many years ago (and made me want my own Cine 8 camera for animation when I was little). It wasn’t long before the director was snapping away, adjusting the scene and taking shot after shot – needless to say she was loving every bit! Thankfully, the “director” did let me animate a few things, but she was very clear what she wanted and what was going to happen. Sharing our ideas we also used post-it notes to add a little dialogue to the film too – silent movie style! Everyone enjoys a Royal Wedding! She even wanted to add lighting effects to make it night and morning again (alas the automatic settings of the Camera Module adjusted for the lighting conditions so this was not possible). We even used the preview “Animate” feature of the application to que up the images we’d taken and review the footage so far (and experiment with the frame rate). Initially the film was produced using the application, however since it rendered at a default of 24 frames per second it was way too fast (the mind of a 7 year old can only be slowed down so far, and making things move slowly is asking a lot!). Therefore I re-rendered the images at a more realistic frame-rate of 1 frame per second (I just needed a small adjustment to the rendering command-line). Extra Thoughts: Again, this will need to be another control I add to the application (originally had I thought you’d want a fixed frame rate for the final video, and the variable frame rate would only be useful for reviewing things – it wouldn’t take much allow the selected frame rate to be used for the rendered video if desired). It wasn’t all plain-sailing, I setup the Raspberry Pi on a fairly new SD Card image and I did run into a few problems. It is important to remember that the drivers for the Raspberry Pi camera module are adapted from drivers for mobile phones, so in several cases we are using the device in a different way to how it was originally intended/tested, hence why sometimes things don’t quite work as expected. The drivers are still evolving and changing, so you may find things that worked before might get broken and old problems get resolved when you update. The best tip here is to get it set up and tested before you invite your director to start work! This appeared to resolve the problem for the animation session. However, I’ve since had the error return and then go away again, suggesting my issue may be hardware/power/cable related too (it is something I will monitor and update this section if I manage to work out what is happening). This will change the preview image to use “PREVIEW.jpg” instead of “PREVIEW.gif”. Due to the modular approach we use in Chapter 8, this single line will change the preview format for all of the examples, fixing it for all cases. This shows how useful it is to do things in this way. I think you are probably correct, the issue is only recent. When I get chance to confirm with another camera I will update this post.